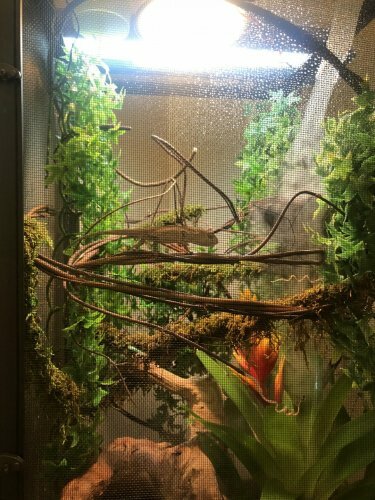 Hello we are new chameleon parents and wanted to know what everyone thinks of the terrarium! We have an ambilobe that's about 3 months old! So far he's loving it just started getting used to the cage and eating a lot! Now he's having his first shed! Any tips or tricks to make this little guy even happier let me know! His bask is about 85-90! Humidity 60-70% and the bottom of the cage is 70 and the middle is about 75-80! 5 percent UV strip also just came in not in photo! Hopefully we are doing well! Love to hear comments and concerns! Excited to meet everyone thank you for your comments!! What kind of plants are you using if any of them are real. Make sure you use plants that won’t get your chameleon sick. When I first got my chameleon my cage set up was all wrong. I didn’t realize how much work goes into these beauties but I’ve learned a lot since then. From what i can see your enclosure looks great! Id lower the basking temp, find a sweet spot in the low 80s. Make sure your UVB light is either a 5% or 6%. 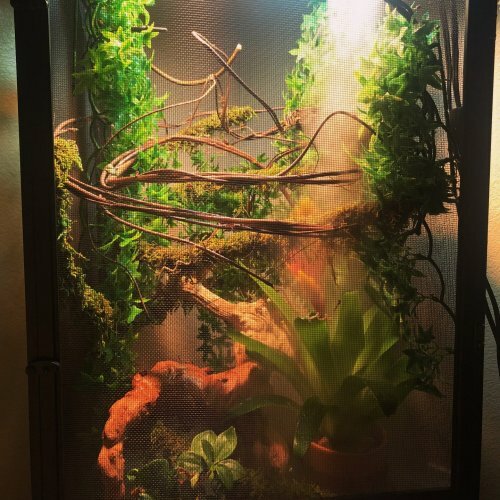 Make sure youre misting down the cage atleast 3 times a day. Wed need to know what youre feeding and you supliment scheudle to know if your husbandry is correct. ◦Handling - How often do you handle your chameleon? Not really at all currently trying to get him acclimated at home first! ◦Feeding - What are you feeding your cham? What amount? What is the schedule? How are you gut-loading your feeders? I am feeding him Crickets mainly he doesn't seem to like any kind of worm at all... I've tried meal worms, super worms, and horn worms now he didn't eat any of those! I am gut loading my crickets with carrots and kale and supplementing the calcium (No D3) every other day and multivitamin once every other week and sticky tongue farms every other opposite week. ◦Supplements - What brand and type of calcium and vitamin products are you dusting your feeders with and what is the schedule? Rep cal herptivite multivitamin, reptivalcium, sticky tongue farms miner-all. ◦Watering - What kind of watering technique do you use? How often and how long to you mist? Do you see your chameleon drinking? Fog machine goes off every hour 7 minutes and misted 3 times a day. Also a dripper for water. Here's our little guy Rufus!